You might have seen few funny facebook walls with names of high professionals on it, maybe some delegates or so talking on about some matter, discussing liking few things and even adding a fake relationship status update, well obviously everything is fake what you see as its created using a simple online tool called “The Wall Machine” which basically comes up with an pre defined status editor that you can use to edit names, status updated, adding profile pics and then snapping it up and posting it on Facebook or other social media service. Well now if you are still confused about what kind of fake wall I am talking about then just have a look at below wall, well I have created this wall using this same service and it looks really funny so have a look at below. 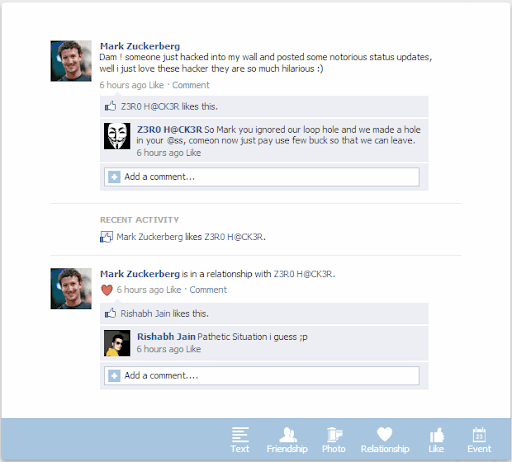 So as you can see the above image is absolutely fake and I have taking that Mark Zuckerberg wall hacking update and manipulated it to make some nice Mark Trolling image, so if you want to have some fun with your friends you can use this same service and create some pranking walls easily. So I have even posted a video onto this thing so have a look at that video too. Now just Login using your Facebook Account & you can get access to their editor. Now you will see editor like above in the image, so now just click on the name and you can easily edit them and add any other name so it depends upon you. You can also upload some nice image to make it look more like original. So just choose the Google Search option and write that person name, it automatically provides you small images perfect for profile picture. Now just crop that image and then apply that image. Now you can also see few more options on the Sky Blue Bar like in the above image just click then and add more stuff. That’s it now after your have completed just press Save and your are done you need to provide some nice title and then just get to share it with your friends. You can even snap the image to your desktop using the Snipping Tool or Print Screen option provided by default in Windows.